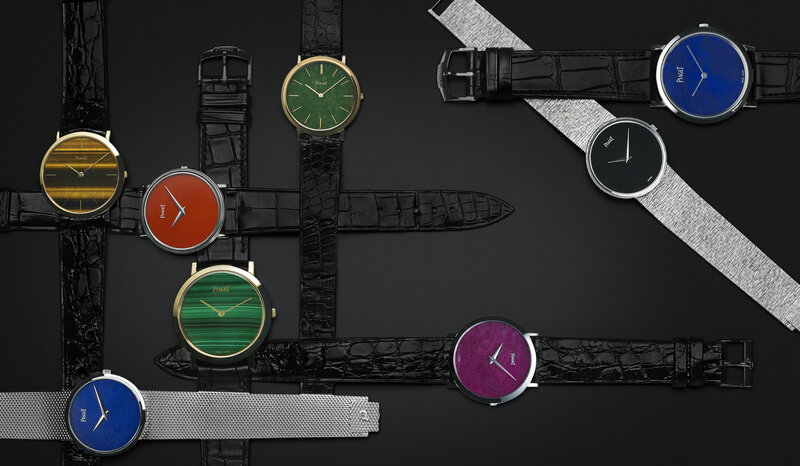 Piaget Altiplano watch faces made of stone, from left to right: tiger’s eye, lapis lazuli, coral, malachite, jade, ruby, onyx and lapis lazuli. In fashion, the insouciance of the ’60s and ’70s found expression in bell-bottom trousers and flowing caftans. In watchmaking, the same bohemian style was reflected in colorful hard stones that brought a splash of color to watch dials. And now that same style is finding favor among watchmakers today. Piaget in the late 1960s was among the first to produce dials decorated with opaque semiprecious stones, fitting thinly sliced turquoise, lapis lazuli, malachite and opal on top of its watch movements and under the sapphire glass. During those two decades, Piaget’s designers put watches with hard stone dials on simple straps or bracelets with intricate links, on outrageously ornate manchettes or cuffs, on gem-set or polished bezels, or as jeweled pendants. When property from the estate of Jacqueline Kennedy Onassis went on sale at Sotheby’s in 1996, Piaget acquired her oval jade-dial watch set with diamonds and green tourmalines on a mesh bracelet. It is now in the company museum in Geneva. In recent years, just as fashion brands have repeatedly revisited those decades, interest in hard stone dials has risen, their popularity reflected in higher auction prices and the number of brands bringing hard stones into their decorative repertory. “There is a very strong interest in vintage hard stone watches on the market,” said Sabine Kegel, senior specialist in Christie’s watch department. Most in demand are vintage pendant watches and the cuff watches that Piaget made in limited numbers. An unusual Piaget bracelet watch set with tiger’s-eye plates from 1970 sold last November at a Christie’s auction in Geneva for 57,500 Swiss francs, or $58,150, over twice its high estimate of 25,000 francs. Piaget resumed making hard-stone watches in the early 2000s, using a larger selection of stones. In 2015, a Piaget cuff bracelet watch accented with opal and onyx, inspired by a vintage model, was shortlisted for the top jewelry prize at the Grand Prix d’Horlogerie de Genève. This year, to celebrate the 60th anniversary of the Altiplano, the ultrathin model most often associated with hard stone dials, Piaget has brought back two limited-edition models, one with a turquoise dial set with diamonds ($32,000), and another with a white opal dial with iridescent facets ($48,000). Among other brands, Cartier this year introduced its Rotonde de Cartier Mysterious Hour, in which for the first time a technique of hard stone marquetry was applied to set four different colored stones — lapis lazuli, agate, cacholong (a variety of opal) and obsidian — into a geometric pattern on the dial. This year the jewelry designer Suzanne Syz, based in Geneva, presented her first line of watches, Her Ben, in titanium, rose gold or white gold. The timepieces featured two dials — an outer decorative one and an inner functional one — both in a marquetry of white agate and black onyx. For all their beauty, hard stones are extremely difficult to handle, even with current technology and skilled craftsmanship, because the stones are fragile and must be cut thinly. Richard Mille, a brand best known for its high-performance watches, experimented with hard stones to decorate its RM 018 in 2009, when it produced a timepiece in collaboration with Boucheron to commemorate the jewelry house’s 150th anniversary. François-Paul Journe, known for his complicated classic watches, embarked two years ago on a project to produce a watch decorated with hard stones for a friend, the Swiss collector Stéphane Barbier-Mueller. Taking his inspiration from the Florentine tradition of inlaid stones, called pietra dura, Mr. Journe used onyx and four shades of jasper — white, black, green and red — that he set on both the dial and the watch case using a cloisonné technique similar to that used for enamels. Two years later, of the 10-piece edition Mr. Journe was planning to produce, only two have been completed. A version of this article appears in print on March 24, 2017, in The International New York Times.